LBP was born from an anonymous blog I started writing some six years ago whilst I still lived in East London, Hackney. I came up with the name with my husband so I could blog about my adventures in the city whilst baking something new every week and given that the Bakewell was my favourite bake, and we lived opposite what we considered to be the best park around (Victoria Park), Lady Bakewell-Park was born. She didn’t become a real-life entity until 2013 when, after having spent some time baking in professional kitchens in London (and after having to take a hefty pay cut from the branding world I had previously been in), I realised that this was what I really wanted to do, but that I wanted to go it alone. We moved back to the Suffolk / Essex border and at my kitchen dining room table, LBP became a real-life business. We LOVE seeing Tatty Devine in your Instagram snaps! What's your fave piece? My Tatty collection is extensive, it’s really hard for me to pick a favourite piece! I adore the pink poodle necklace I have as this was how we announced we were having a little girl when I was pregnant. The mini Lobster is a great classic timeless piece that I love to wear on New Year’s Eve or such. And probably my speech bubble that I choose what was going to be on each side; You remind me of the Babe, and I’m lightning on my feet; two perfect pop classic lyrics which sum me up to a tea. I first got into baking much like most people, Saturday afternoons with my Mum. My blog took on a Julia-Julia inspo where I baked something new each week for a year to try and perfect my baking skills… which sorta had the desired effect. I got better, my confidence increased and I soon realised that I wanted to spend every day doing it. There tend to be two very obvious inspirations: people around me and songs. Without music, I fail to work that effectively. And without people that mean something to me, I fail to feel inspired. 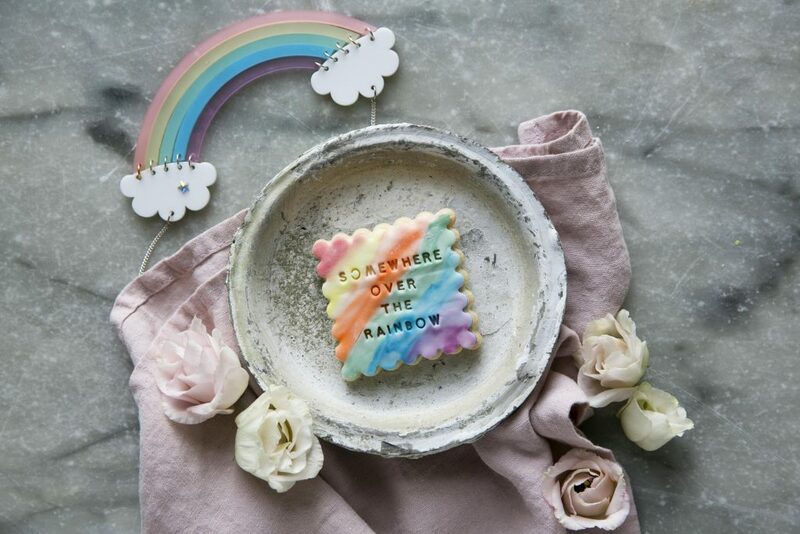 I put those two things to good use in the kitchen, calling on my favourite tunes and lyrics to give me something to pop on a biscuit, and people that I love to help me come up with colour designs. I try and keep my baking simple to a point; simple shapes, classic colours, great lyrics. My Daughter, Music, Friends, Cuddles, Gin/ Prosecco (those two things together actually). What have you been super proud of recently? The boring every day; may sound weird but the mundane is the hardest stuff to get through sometimes. Juggling all the balls in the air, sometimes one or two going awry, but managing to get them all back up in the air again. That. What's next for Lady Bakewell-Park? If I knew the answer, I’d happily tell you… I honestly don’t know. LBP has been through a tricky year and I'm looking forward to 2018 bringing new exciting things that may push LBP into a new chapter.